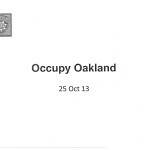 The following documents were obtained via a public records request made by members of Occupy Oakland. The documents concern the Oakland Police Department response to protests against the 2013 Urban Shield homeland security exercise held in Alameda County. 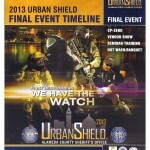 Urban Shield is an annual exercise series that features nearly fifty different training scenarios for law enforcement ranging from terrorist attacks conducted by “homegrown extremists” to hostage situations, fires and even natural disasters. The 2013 Urban Shield exercise involved dozens of federal, state and local law enforcement organizations, representatives of foreign countries such as Switzerland, Brazil, Bahrain, Jordan, as well as more than a dozen corporations including FedEx, Cisco Systems and Verizon Wireless. The documents are heavily redacted and include an operations plan, a presentation on Occupy Oakland, arrest reports and other miscellaneous documentation related to the protests.